I would like to find a place to get parts for a drop side Little Folks Crib so that I can get the crib put together. If I could find one, I might also be interested in a new mattress base for the crib. If anyone has any information on replacement parts for a drop-side Little Folks Crib, please send it to me using the space below (also sent me your contact information to use if I find that I need to get in touch with you). Please post a list of the crib replacement parts that you have to offer using the comments form below. 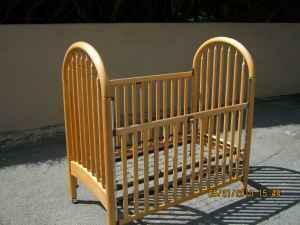 Unique Baby Gear Ideas encourages everyone that sees this want ad to share their resources for Little Folks crib replacement parts, information on drop side crib recalls and to consider writing reviews of their cribs to make expectant parents aware of any problems that are associated with Little Folks baby cribs. Please refer to this article with information regarding the recalls and ban on drop side cribs. You don't say which parts that you need or if you are aware that Little Folks cribs with drop sides can malfunction, detach or fail creating a safety hazard for babies. The drop sides, while helpful to parents, is dangerous for babies as they have a space where an infant or toddler can roll into and strangle or suffocate. Drop sides may also allow a little one to fall out of the bed and injure themselves.